Approaching the twilight of a persons life one may very well want to dismiss the thought of passing to the "great beyond", or embrace practical reasons, in addition to personal feelings on methods to prepare for such an event. When I was offered a position with management company that helped provide education to the employees of funeral homes and the public regarding advance funeral planning, I wondered why the company, and the CEO, in particular, felt I was a good fit. He didn't elaborate on my 20 plus years insurance experience, management background, "coaching" and enthusiasm, but simply said " you have real life experiences". You see he knew a few years prior, I had a task of flying back to my home town when my father passed away to make arrangements for his funeral and deal with upset family members, including my mother, on the worst day of our lives. Dad had some life insurance but financial arrangements were a consideration. Because Dad was not an old man for modern mortality expectations, many came to the visitation and funeral to express their condolences. He was a WWII veteran and I did remember he mentioned a request for military honors as provided by our country. All was taken care of well by the assistance of our funeral homes and the CEO previously mentioned, that owned the firm. We had been friends in college and he and his staff were very helpful. As mentioned before, he now had a separate company that provided advance planning training for employees of funeral homes. The education was extended to the public by licensed professionals. By reaching out to families, an opportunity was available to make funeral arrangements ahead of time. As explained, some people can very well embrace the concept of relieving loved ones from the shocking emotional experience and financial burden inevitable. Therefore, consider the options available. Seek out someone who has options that may fit your needs. My mother was one that decided she wanted to take advantage of my new found expertise. She passed away almost 20 years later. We all celebrated her life. Not any one of us had to focus on tougher decisions she had already made. Financially, it was taken care of by the process of the life insurance trust. Real life, and a celebration for what they brought to all of us. Next, I'll be more specific on the difference between irrevocable life insurance trusts and final expense life insurance as choices. On Wednesday March 4th I gave a presentation to the Shepard Center Advisory Board on general differences in a final expense life insurance policy and an irrevocable funeral trust. The later is usually associated with a sponsored funeral home goods and services agreement and a "planned" funeral service after a discussion with the consumer or the proposed applicants family. The meeting of the advisory board concerns its service to Hamilton County Seniors in Indiana and each member is sometimes asked to present a topic that may be of interest to the board and the community. 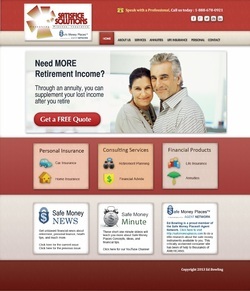 Ed Bowling, CPCU, AIS and Satisfice Solutions, LLC launch new web site. Ed Bowling CPCU, AIS can be contacted at 317-439-5806 or edbowling@satisficesolutions.com.